Background This study aimed to evaluate whether incidental CT findings of emphysema, airway thickening and bronchiectasis, as seen on CT scans performed for other non-pulmonary clinical indications, are associated with future acute exacerbations of COPD resulting in hospitalisation or death. Methods This multicentre prospective case–cohort study comprised 6406 subjects who underwent routine diagnostic chest CT for non-pulmonary indications. Using a case–cohort approach, we visually graded CT scans from cases and a random sample of ∼10% of the baseline cohort (n=704) for emphysema severity (range 0–20), airway thickening (range 0–5) and bronchiectasis (range 0–5). We used weighted Cox proportional hazards analysis to assess the independent association between CT findings and hospitalisation or death due to COPD exacerbation. Results During a median follow-up of 4.4 years (maximum 5.2 years), 338 COPD events were identified. The risk of experiencing a future acute exacerbation of COPD resulting in hospitalisation or death was significantly increased in subjects with severe emphysema (score ≥7) and severe airway thickening (score ≥3). The respective HRs were 4.6 (95% CI 3.0 to 7.1) and 5.9 (95% CI 3.4 to 10.5). 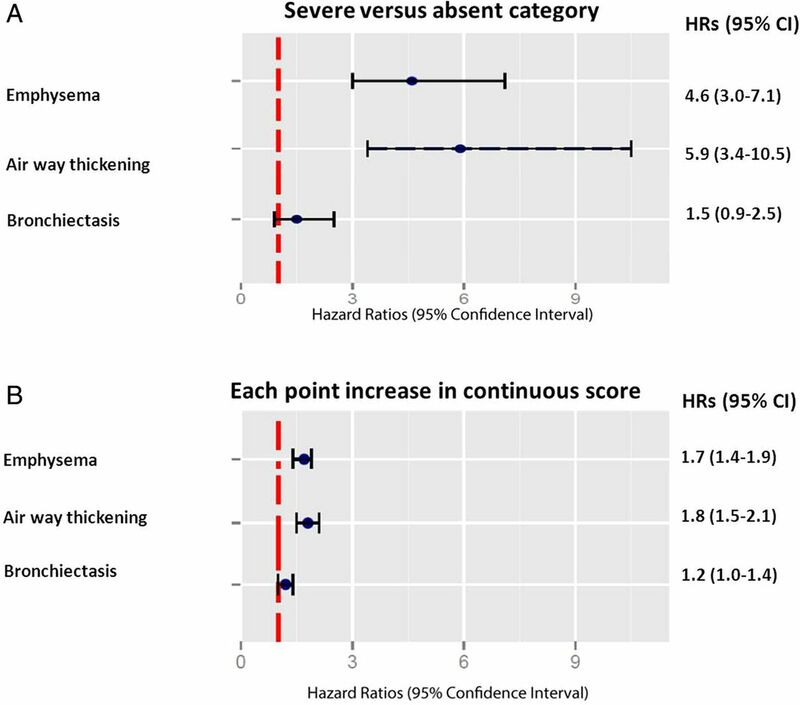 Severe bronchiectasis (score ≥3) was not significantly associated with increased risk of adverse events (HR 1.5; 95% CI 0.9 to 2.5). Conclusions Morphological correlates of COPD such as emphysema and airway thickening detected on CT scans obtained for other non-pulmonary indications are strong independent predictors of subsequent development of acute exacerbations of COPD resulting in hospitalisation or death. Can incidental findings at CT scans performed for other, non-pulmonary clinical indications predict future acute exacerbations of COPD resulting in hospitalisation or death? Morphological correlates of COPD such as emphysema and airway thickening detected on CT scans obtained for non-pulmonary indications can be used as predictors of future acute exacerbations of COPD and mortality without additional radiation exposure or costs. This study demonstrates that assessment of incidental CT findings of emphysema and airway thickening may enable healthcare providers to detect patients with COPD at high risk of complications at an early stage and better target these subjects for more tailored treatments based on incidental information embedded in CT.
Morbidity and mortality from COPD continue to rise.1 Hospitalisations for exacerbations account for US$18 billion in direct costs annually in the USA and are associated with 1-year mortality of 21% and 5-year mortality of 55%.2 Detection of subjects at risk of acute exacerbations of COPD requiring hospital admission or resulting in death is therefore of major importance. Interestingly, pulmonary alterations associated with COPD can be depicted with cross-sectional imaging techniques.6 On the basis of this premise, pulmonary CT has been proposed as an important tool for assessing the presence and extent of COPD, as this imaging technique is highly sensitive to findings such as emphysema, airway thickening and bronchiectasis.7 ,8 However, in current clinical practice, CT has no role in the evaluation of COPD.9 On the other hand, smokers or ex-smokers who have subclinical or undiagnosed symptomatic COPD frequently undergo CT imaging for non-pulmonary indications.10 ,11 Thus, radiologists are routinely confronted with incidental findings —that is, unsuspected findings or findings unrelated to the indication for CT imaging.12 The present study aimed to investigate whether incidental CT findings related to COPD, such as emphysema, airway thickening and bronchiectasis, obtained from CT scans performed for other, non-pulmonary, clinical indications are associated with future acute exacerbations of COPD resulting in hospitalisation or death. The present study is an ancillary study of the PROgnostic Value of unrequested Information in Diagnostic Imaging (PROVIDI) Study, which is a case–cohort study. It was approved by the medical ethics committee of the primary participating facility, University Medical Center Utrecht (number 06/193), and the institutional review boards of all other participating centres. Written informed consent was waived for all patients because of the study design. A privacy protocol was implemented such that no patient information would be visible when the CT images were being read, no additional information would be obtained by accessing a patient's medical records, and no patient would be contacted as a result of the study. The rationale and study population of the PROVIDI Study has been described in detail elsewhere.13 Briefly, the study population comprised 23 443 subjects aged ≥40 years who underwent routine clinical chest CT scanning between 2002 and 2005 for diagnostic indications in participating hospitals in the Netherlands. Patients with a diagnosis of primary lung cancer (including mesothelioma) or distant metastatic disease from other types of cancer (excluding haematological malignancies) at baseline were excluded (n=9 077) because it was highly unlikely that detection of unexpected image findings would alter clinical decision-making in patients with such a poor prognosis. Also excluded were participants for whom follow-up data could not be obtained because they could not be linked to the Dutch National Diagnosis and Death Registry (n=942). In addition, patients with a prior history of acute COPD exacerbation that required hospital admission, as well as patients with CT referral indications directly related to (suspected) pulmonary pathology including PEs and pulmonary malignancies, were excluded (n=7018) to ensure that COPD-related imaging findings were truly ‘incidental’. Overall, 6 406 subjects from eight participating hospitals represent the full baseline cohort and were included in the present study. Subjects who were hospitalised or died due to a COPD exacerbation during follow-up were identified as cases. We used a case–cohort approach, as introduced by Prentice and Self,14 using all cases and a subcohort consisting of a random sample of ∼10% of the full cohort at the beginning of the study. With random sampling fractions of ≥0.10, results of a case–cohort analysis are similar to the full cohort analysis.15 Cases together with the subcohort define the study population. The advantage of this design is that it enables survival analysis with reliable risk estimates without the need to evaluate all chest CT scans from the full cohort. Figure 1 shows the flowchart of the study design and selection of the study population. Flowchart of study design. CBS, Central Bureau of Statistics. LMR, Dutch medical data registration. All chest CT examinations were performed using multidetector row CT scanners (2–64 detector rows) from different vendors. Routine clinical protocols were used in participating hospitals. If subjects underwent more than one chest CT examination during follow-up, the findings from the first examination were used. All types of CT (including non-contrast and non-ECG-triggered) were considered eligible as long as the field of view encompassed the entire lung parenchyma, from the apex to the base of the lung. Section thickness (maximum 10 mm) varied according to the chest CT indication and protocol used. A research physician abstracted patient characteristics and information about the indications for CT from the radiology reports. CT indications were classified as one of the following: cardiovascular disease; trauma; haematological malignancy; mediastinal disease; or other. CT abnormalities of emphysema, airway thickening and bronchiectasis were defined according to the Fleischner Society criteria.19 The presence and extent of these CT findings were graded using a straightforward pulmonary lobe-based visual grading system as listed in table 1. Airway thickening and bronchiectasis were visually graded as absent (score=0) or present (score=1) for each of the five pulmonary lobes. The five separate scores of each pulmonary lobe were summed into a total score ranging from 0 to 5. Subsequently, four degrees of severity were obtained by categorising each CT finding as follows: grade 0, absent (total score=0); grade 1, mild (total score=1); grade 2, moderate (total score=2); and grade 3, severe (total score ≥3); this culminated in a potential maximum score of 15 points. Presence and extent of emphysema were scored using the system from the National Emphysema Treatment Trial.20 Each pulmonary lobe was visually scored for the percentage affected by emphysema (0=0%, 1=1–25%, 2=26–50%, 3=51–75%, 4≥75%). The five separate scores of each pulmonary lobe were summed into a total score ranging from 0 to 20. The severity of emphysema was categorised into four categories: grade 0, absent (total score=0); grade 1, mild (total score=1–3); grade 2, moderate (total score=4–6); and grade 3, severe (total score ≥7). Examples of the different grades of COPD-associated pulmonary abnormalities can be found in figure 2. Examples of CT findings for COPD. (A) Emphysema; (B) airway thickening and bronchiectasis (arrow). Data on the incidence of COPD events requiring hospitalisation were obtained from the Dutch National Registry of Hospital Discharge Diagnoses (ICD-9 codes 491,492, 496). Data on COPD events resulting in death were obtained from the National Death Registry (ICD-10 codes J41–J44 and J47) from baseline until January 2009.21 Further details are provided in the online supplementary file. Baseline characteristics and chest CT findings were summarised for cases as well as the subcohort. Age is a continuous variable presented as median with IQR because of non-normal distribution and was compared between the cases and subcohort using the Mann–Whitney test. The categorical variables, gender, emphysema, airway thickening and bronchiectasis, are presented as percentages and were compared between cases and the subcohort using the χ2 test. Cox proportional hazard analysis with an estimation procedure adapted for the case–cohort design according to Prentice and Self14 (details are provided in the online supplementary file) was used to establish the strength of association of the explanatory variables (emphysema, airway thickening and bronchiectasis) with hospitalisation or death due to a COPD exacerbation. Results are reported as HRs and their 95% CIs. HRs are presented in two ways: (1) for the mild, moderate and severe categories compared with the absent category; (2) for each point of increase in total score. In addition to crude associations, HRs were adjusted for age, gender, CT indication and hospital in which the CT was performed. Finally, Kaplan–Meier analysis was used to compare COPD event-free survival between absent, mild, moderate and severe categories of the strongest and independently associated CT findings. Analyses were performed with the R-project software package, V.2.15 (http://www.r-project.org). Among the 6406 subjects of the baseline cohort, 338 patients were hospitalised or died due to a COPD exacerbation during a median follow-up time of 4.4 years (maximum 5.2 years). Table 2 compares the clinical and CT findings of the subcohort and the COPD cases. Patients who were eventually hospitalised for COPD or died due to COPD were older. More than half of these patients underwent chest CT for a cardiovascular indication and had a shorter follow-up time, and all the CT abnormalities were detected more frequently compared with subjects in the subcohort. In table 3 crude and adjusted HRs and their 95% CIs for COPD events are presented for the mild, moderate and severe categories of emphysema, airway thickening and bronchiectasis compared with the absent category. HRs for comparison of severe versus absent CT findings were as follows: emphysema, HR 4.6 (95% CI 3.0 to 7.1); airway thickening, HR 5.9 (95% CI 3.4 to 10.5); bronchiectasis, HR 1.5 (95% CI 0.9 to 2.5) (figure 3A). After estimates had been fully adjusted for age, gender, CT indication and referral centre, the association of bronchiectasis with COPD events was no longer significant. Multivariable adjusted HRs and 95% CI for COPD events. (A) Multivariable adjusted HRs and 95% CI comparing the severe versus the absent category of emphysema, airway thickening and bronchiectasis. (B) Multivariable adjusted HRs and 95% CI for each point of increase in total emphysema, airway thickening and bronchiectasis score. Table 3 also presents crude and adjusted HRs for each point of increase in total score of the CT features. Adjusted HRs and 95% CI for each point of increase in total emphysema, airway thickening and bronchiectasis score were 1.7 (95% CI 1.4 to 1.9), 1.8 (95% CI 1.5 to 2.1) and 1.2 (95% CI 1.0 to 1.4), respectively (figure 3B). Emphysema and airway thickening were CT findings independently related to future COPD events after full adjustment for sum scores. Kaplan–Meier curve analysis (figure 4) shows that the difference in risk of hospitalisation or death due to COPD is most evident between the absent and severe categories for emphysema and airway thickening. The 5-year risk of the combined end point, hospitalisation or death due to COPD was 15% for subjects classified in the severe emphysema category compared with 4% for subjects in the absent category. For the severe airway thickening category, the 5-year risk was 17% compared with 5% in the absent category. Kaplan–Meier survival curve for COPD events stratified by severity category of emphysema and airway thickening. (A) Emphysema; (B) airway thickening. Green, absent category; blue, mild category; red, moderate category; orange, severe category. 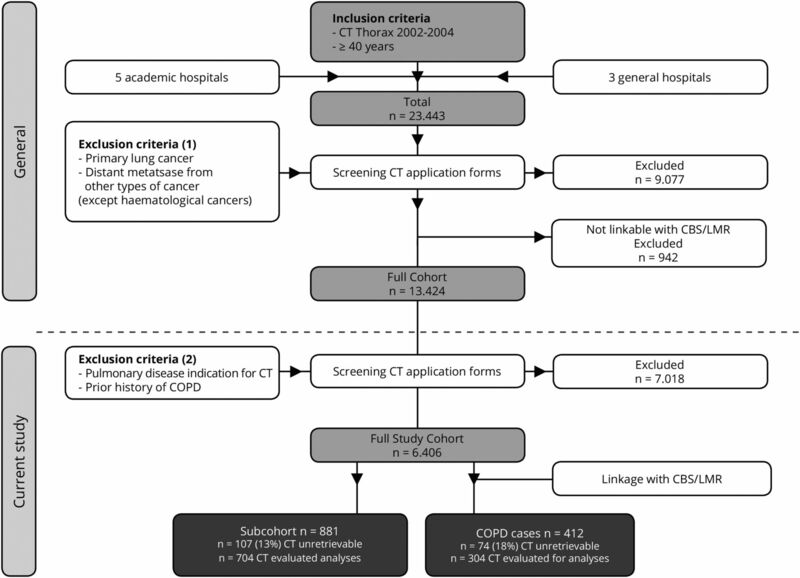 In this case–cohort study of 6406 subjects who underwent routine clinical chest CT scanning for non-pulmonary indications, incidentally discovered visually graded CT findings of emphysema and airway thickening were related to future hospitalisation or death due to acute COPD exacerbations. These associations were independent of age, gender, CT indication and referral centre. Thus, reporting of freely available incidental CT findings by radiologists may aid the prediction of the first COPD exacerbation resulting in hospitalisation or death. Reporting of prognostic CT findings of COPD with a simple lobe-based visual grading system in a population who underwent routine chest CT scanning for non-pulmonary indications can have substantial implications, although we do not claim that incidental CT findings provide added predictive value over existing models or other well-known COPD risk factors in the prediction of COPD risk. We postulate that incidental CT findings for COPD risk prediction could provide a novel strategy and adequate estimation of COPD risk irrespective of spirometry. This study demonstrates that readily available CT findings have HRs as high as 4.6 and 5.9 after accounting for age and gender. Therefore, we advocate that radiologists should use these data effectively, starting by reporting of these findings to the clinicians. Subsequently, healthcare providers may recognise individuals at high risk of future complications of COPD at an earlier stage and can take appropriate action. It is well known that treatment of COPD exacerbations has not significantly improved, and clinical failure rates (defined as the need for additional treatment or hospitalisation) of 20–40% within 1 month are still common.23 Even in subjects already known to have COPD who have not been hospitalised previously, incidental CT findings could potentially be used to guide comprehensive lifestyle intervention in addition to stricter control of risk factors and intensified pharmacological treatment. The use of incidental CT findings for detection of COPD in patients undergoing evaluation with chest CT evaluation for other clinical indications has been proposed.24 ,25 In accordance with our study, these previous findings demonstrated that emphysema and airway thickening were positively related to COPD. However, these studies were cross-sectional and merely evaluated the presence of COPD at the time of CT scanning in a lung cancer-screening cohort. To our knowledge, we are the first to have performed a longitudinal study investigating whether CT findings are associated with future hospitalisation or death due to COPD in a population who underwent routine chest CT scanning for non-pulmonary indications. Moreover, since prior studies reported quantitative assessment of COPD findings in a lung cancer-screening cohort, the generalisability of those results is restricted to chest CT scans following specific scanning protocols. Exacerbations of COPD requiring hospital admission have large effects on health status, mortality and healthcare costs.2 However, recent statements from experts in the field of pulmonary medicine stress that, in patients who have previously been hospitalised for COPD, preventive measures are probably ‘too little, too late’ although, in patients who have not been previously hospitalised for COPD, a great deal is to be gained from earlier detection.23 One of the strengths of this study is that it explicitly predicts the first COPD exacerbation resulting in hospitalisation or death in patients not previously admitted for COPD or even not diagnosed with COPD who underwent chest CT scanning for non-pulmonary indications. To avoid bias, we excluded patients who had been previously hospitalised for COPD, since evaluated imaging findings would not have been truly ‘incidental’. The lobe-based visual grading score used in this study allows us to grade CT findings associated with COPD based on a broad range of diagnostic multidetector row chest CT scanners and imaging protocols. Given the millions of these scans performed annually,28 the simple lobe-based visual grading system described may have great impact on healthcare expenditure. One caveat, though, is that lobe-based visual assessment of CT imaging findings is known to have lower inter-reader reliability than quantitative CT measurements in COPD.29 Despite this limitation, we favoured this method for various reasons. Quantitative CT measurements in COPD need adherence to strict CT acquisition protocols, which is not common practice in routine chest CT imaging. Visual assessment of COPD findings has been demonstrated to be relatively simple, inexpensive and independent of machine and reconstruction algorithms.30 Moreover, visually graded CT findings of COPD correlate well with physiological assessments,7 enabling reliable prediction of future hospitalisation or death due to acute COPD exacerbations, thereby fulfilling the aim of this study. Our study has limitations that should be acknowledged. Because of the specific study design, detailed clinical information, such as smoking status, pulmonary function-based COPD status, comorbid conditions and case-mix factors, were not available. Therefore, we could not establish whether the relation between the CT findings and future hospitalisation or death due to COPD was independent of other clinical information besides age and gender. In addition, our results pertain to the Dutch healthcare system with moderate use of CT. The hazards for the predicted disease, COPD hospitalisation and mortality are to some extent a composite of the risk associated with CT abnormalities and the risk of the population in whom the CT is performed in the first place. Therefore, the results of our findings may not apply in healthcare systems with limited or intense use of chest CT scanning. In conclusion, morphological correlates of COPD such as emphysema and airway thickening detected on CT scans obtained for non-pulmonary indications can be used as markers of future acute exacerbations of COPD resulting in hospitalisation or death, without additional radiation exposure or costs. Reporting of incidental CT findings for COPD with a simple lobe-based visual grading system on the broad range of chest CT scans performed in daily clinical practice can be a useful strategy to identify high-risk COPD subjects in whom more aggressive therapeutic interventions should be considered.
. Identification of chronic obstructive pulmonary disease in lung cancer screening computed tomographic scans. JAMA 2011;306:1775–81. Collaborators PROVIDI Study group: J Laméris (Academic Medical Center, Amsterdam), C van Kuijk (VU University Medical Center, Amsterdam), W ten Hove (Gelre Hospitals, Apeldoorn), M Oudkerk (University Medical Center, Groningen), A Oen (Elkerliek Hospital, Helmond), J Wildberger (Academic Hospital, Maastricht), J van Heesewijk (St Antonius Hospital, Nieuwegein), W Mali (University Medical Center, Utrecht) and Y van der Graaf (University Medical Center, Utrecht). Contributors YvdG and WPTMM were involved in study design and conceived and designed the study. YvdG, PMJ and PAdJ coordinated the study data collection. YvdG and PMJ developed the statistical approaches and were involved with analysis, interpretation and writing of the manuscript. All authors contributed to and approved the final version of the manuscript. Funding This study is part of the PROVIDI Study and is funded by the Netherlands Organization for Scientific Research-Medical Sciences (NWO-MW), grant 40-00812-98-07-005; no relationship with industry exists. The funding sources had no influence on study design, collection, analysis or interpretation of the data, or approval of the manuscript. Ethics approval University Medical Center Utrecht Ethics Committee (number 06/193).